Bolis: Cinque Assoluzzione: 1, 2, 5; Laudate pueri Dominum, Miserere, Letanie della Madonna Santissima; Zamboni Splende fredda luna, O memorie funeste, O come se’ gentile, Feritevi, ferite; Costanzi :Ave Maria; Tessarini: Allettamento Secondo & Terzo; Jommelli: Oculi omnium. What a great CD, with the bonus of an fascinating back-story! 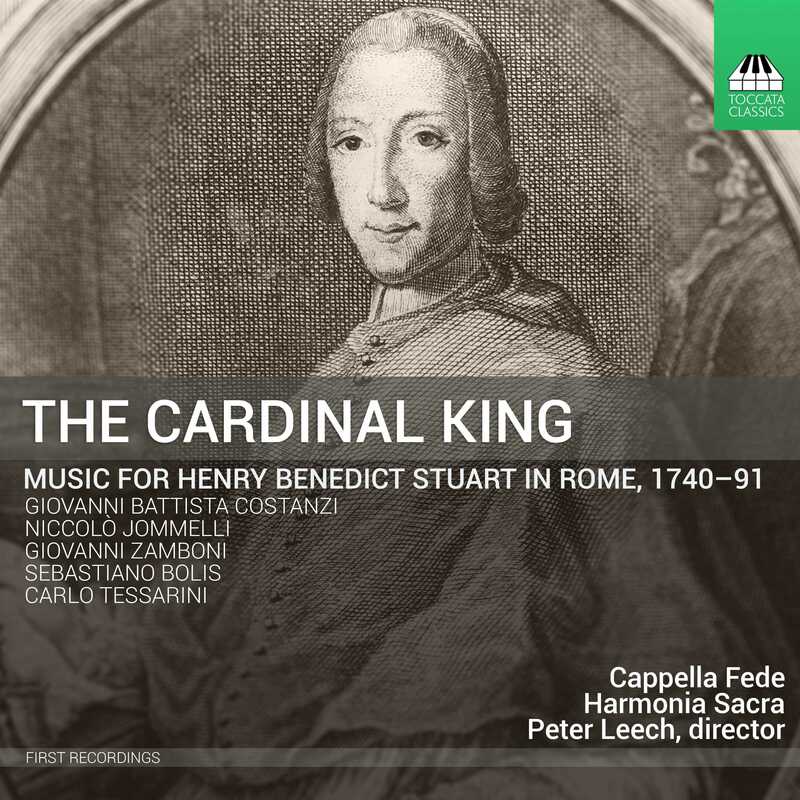 It reflects the music of the exiled court in Rome of Henry Benedict Stuart (1725–1807) during the latter half of the 18th century. Henry Stuart is one of the most interesting characters in the complex world of 18th British politics, religion and royal succession. He was the grandson of deposed King James II of England (and VII of Scotland), son of the ‘Old Pretender’, brother of the ‘Young Pretender’ Bonnie Prince Charlie, and the last in the acknowledged direct line of Jacobite succession to the crown of Great Britain.By the time he was born, in Rome, the Crown had already passed to the German Hanoverians, despite there being more than 50 far better claimants to the throne in terms of blood relations to Queen Anne. But the British Parliament had passed a law preventing a Catholic from inheriting the throne. Unlike his father and brother, Henry Stuart made no active claim to the throne, although he was referred to by his own followers as King Henry IX of England and Ireland (and I of Scotland). Just after his birth he was created Duke of York in the Jacobite Peerage, and recognised as such in Catholic Europe but not in Great Britain. The CD opens with the mournful music of Sebastiano Bolus’s Subvenite sancti, one of the five Assoluzzione, written for the funeral of Bishops around 1780. Bolus is the main composer featured on this recording. Almost completely unknown today, he doesn’t even find a presence on Wikipedia, let alone the New Grove. Two of most substantial works are included: the alternatim setting of the Miserere and the Letanie della Madonna Santissima is the concluding track. At over 12 minutes long, the latter is surprisingly upbeat, considering the nature of the text. It is a glorious example of the Roman Classical style, with elaborately ornamented sections for a solo soprano (Elizabeth Dobbin) alternating with choral passages, the whole while cleverly incorporating the much repeated refrain of Ora pro nobis into the musical texture. The period that this music covers is one that doesn’t often make it onto recordings or the concert platform. On the cusp between the late Baroque and early Classical eras, many of the pieces combine elements of both. The four solo singers and four instrumentalists of Cappella Fede produce fine sounds individually and in consort. Violinist Hazel Brooks, features as the impressive soloist in Tessarini’s Allettamento Secondo (Andante) and his three movement Allettamento Terzo, written for violin and cello. In the other works, organist Matin Knizia provides continuo accompaniment, with some solo passage work in the lively Laudate pueri Dominum by Bolis. The 14-strong Harmonia Sacra choir are equally impressive in their contributions. Director Peter Leech provides a detailed programme note on the composers and the music of the exiled Stuart court, as well as transcribing and editing all the music on the recording, most of which are first recordings. This is an important contribution to musical research, but also a delightful insight into the attractive music that graced the Roman court of a man who could have been a King, were it not for the complexities of religion.